I love this idea! Very Inspiring! I would love to have you link it up to my Feature Friday Link Palooza! Thanks so much. I'll be at your party. Thanks for the invite. So sorry for the loss of your father and Charly's baby. I was wondering what happened when I didn't see any news on the baby arriving. That is so hard! I like your Dear God notes idea....Sometimes writing them down somehow makes them more valid. Will be following your notes and sending hugs your way for you and your family. It has been kind of a tough winter. Thanks so much for thinking of us. 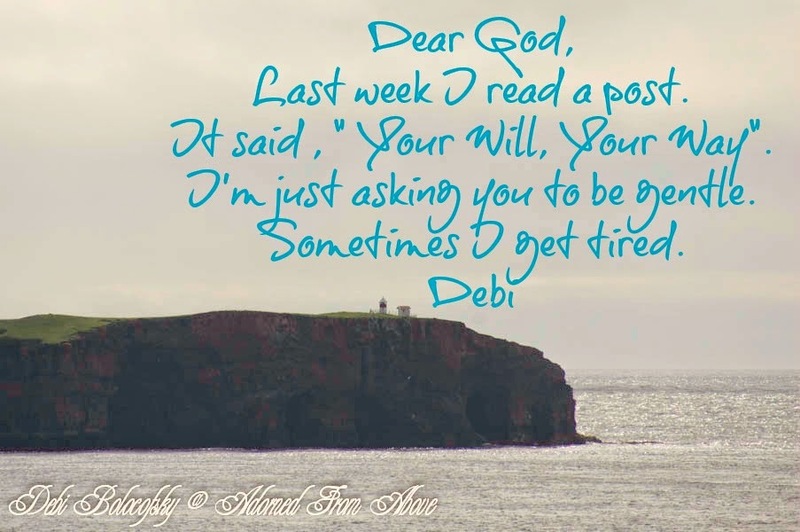 Yes, Lord, please be gentle with my friend, Debi. With so many changes ahead, please give her a calm spirit and smooth transitions ahead, provide your strength in every trial, and expand her faith in You through everything you bring into her life.. Thanks so much. I appreciate your prayers and friendship. Thanks so much and thank you for the party. Thank you so much. I'm so happy that you stopped by.